The cute, nicely designed little bottles of Mio Liquid Water Enhancer. Is it just me, or does Crystal Light have a stigma attached to it? To me, it speaks of dieting and swimsuit-season desperation. Yeah, I used to buy it from time to time, but I always found it tasted of shame and compromise. I gradually learned that a cold glass of water is just as refreshing and tastes markedly better. Then came the fad of flavoured water beverages, many of which are actually packed full of empty calories. (What? You didn’t read the nutrition info panel? You saw “water” in the name and hoped for the best?) Are these “water” drinks much better than pop? Possibly, depending on the brand. But many are still way more calorie-filled than plain old water. So when Mio entered the scene, making a splash with goofy TV ads and cute little bottles, I was intrigued. Squirt Mio into water, we’re told, and it changes everything. Curious to know if they actually tasted good, I bought a couple of flavours: Berry Pomegranate, which is a purple shade, and Mango Peach, a golden-yellow-orange tone. Are they any good? 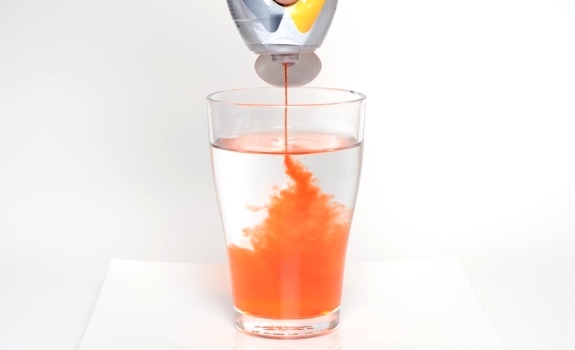 The moment when water meets Mio Liquid Water Enhancer. 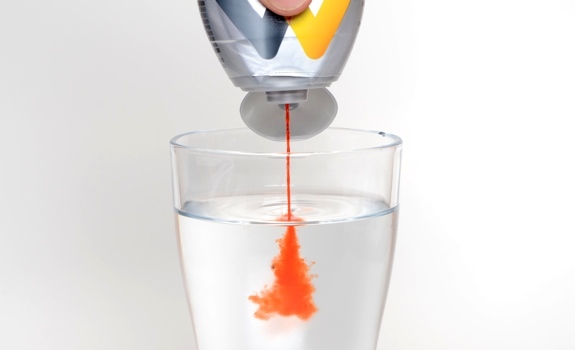 The Pitch: The biggest selling point, as far as I’m concerned, is the easy ability to vary the amount of flavouring used to alter your water; instead of a one-pouch-per-500-mL strategy, you can make it as strong or as weak as you’d like. As such, the “makes 24 servings” claim seems a bit sketchy, as mileage will vary based on how strong you want your water’s flavouring to be. The recommended concentration is “one quick squeeze into 250 mL of water.” Two squeezes will do you for a 500 mL bottle of water. Also, what qualifies as a quick squeeze? The Look: Cute little bottles. Obvious thought went into making the packaging funky. A plastic flip-top pops open to reveal a little squirty nozzle. Turn the bottle upside down, squirt into water, then drink the water. Very functional design. The trade-off is a little plastic bottle that needs to be tossed (or recycled, if you rinse it out, which I’ll probably try to do). On the plus side, that’s a lot less plastic than you’d use with 11 or 12 bottles of pop. The Taste (Berry Pomegranate): Not bad. It’s a very artificial “berry” taste, with a similarly artificial sweetener twang. More tart than I expected, but it counters the sweetness nicely. Bit of a gnarly chemical aftertaste, too. And yet, as an occasional treat to mix up my normal water routine, I might keep a bottle around. The Taste (Mango Peach): Sort of like Jell-O, but peachy Jello-O. Nice quantity of flavour for one moderate-length squeeze per 250 mL of water. It’s peachy in the same way the stuff in those cafeteria “peach drink” dispensers is peachy. The mango note is a bit more whiff-of-gas-pump than I’d like. This flavour, while intense, doesn’t do much for me. I really can taste the service station smell, and it freaks me out. It kind of pleasantly scratches the visual part of my brain to watch Mio work its way into a glass of water. Cost: $3.49 on sale at Co-op. More elsewhere. Value for cash money: Good, especially compared to buying bottles of pop or flavoured water. With 24 servings per bottle, the per serving cost is roughly 15 cents. That seems quite cheap to me. Nutrition? : Per 1/2 tsp (2.0 mL): 0 calories, 0 grams of fat, 0 mg of sodium, 0 grams of fibre, 0 grams of protein. 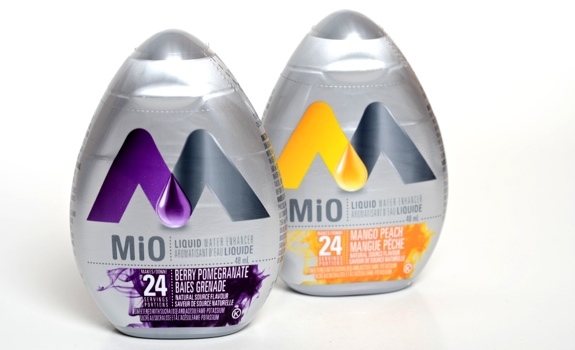 The Fine Print: It looks like Mio is made by Kraft, the same company that makes Crystal Light. Interesting, no? The verdict: Not bad for what they are (at least the Berry Pomegranate one). Yeah, they taste like artificial sweetener, but I’d be willing to try other flavours to see if there’s one I like. I’m also probably going to try these in a glass of carbonated water, just for giggles. I like trying products like this for a little change-up to water. I recently bought a bottle of grapefruit flavoured Perrier which wasn’t too bad.